70% of the earth’s surface is covered by water and about 10% of that is ice. 90% of the total ice mass is the polar ice caps and glaciers. Since the formation of the earth there has always been a natural flux in temperature; though it may not be nearly as large as you think it would be. If the average temperature of the earth dropped by a mere 4 degrees an ice age ravages the planet. If the temperature increased by 4 degrees, all the ice on the planet would melt and the world would flood. Since the industrial revolution in the 19th century however the many compounds that naturally existed in the atmosphere in small quantities have been polluting the air at an alarming rate thought anthropogenic activities. The atmospheric temperature and CO2 concentrations have been on the rise for the last 50 years, in addition the world’s oceans have also increased in temperature. 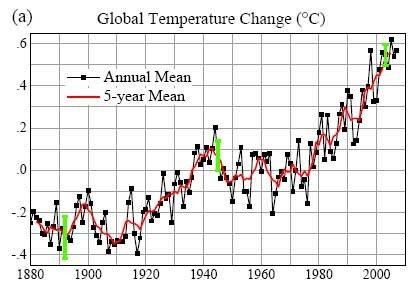 The following graph is from a NASA article stating that the year 2007 was tied with 1998 for warmest year on record and how the greatest temperature change was experienced in the Arctic, causing the glaciers to melt and water levels to rise. Which in turn increase the absorption of sunlight speeding up the melting process. The increase of atmospheric temperature is causing massive depletion of the world’s glaciers. National geographic reports that the Glacier National Park in Montana was the home of 150 glaciers when it was first opened in 1910, now has fewer than 30, its predicted that within 30 years most if not all of the glaciers will have disappeared. Those that still exist have depleted by two-thirds in size. Two-thirds! That’s huge! In only 100 years the glaciers have lost 67% of their total mass! We will lose most of the coastal cities if the glaciers continue to melt at the rate they currently are. As it is stated above 33% of coastal land mass will be lost. This onslaught of fresh water melting from glaciers is also causing drastic changes in the world’s oceans as well. The following is the average amount of salt in open water in parts per million. Due to the fact that when water freezes the salt is left behind, the overall salt content of the earth’s water is only in the oceans, the glaciers are only fresh water. Over the last 100 years 67% of the glacial fresh water has now been re-introduced into the oceans causing stressful even fatal environments for marine life. Certain species are more effected by the change in salinity than others. If we continue to see a rise in salinity we may lose certain type of plankton, oyster, and clam species. These are the same food supply to many marine creature. This change in salinity will also effect the beautiful coral reefs that are already sadly depleted. Which is a main food source for many marine creatures. Not only that but many species accustomed to a salinity level of about 5,000ppm will just not survive in an environment with a lower salt level. If nothing is done we could end up losing much of our existing marine life as well as what coral reefs still exist. Not only are we putting our aquatic life at risk we are also losing the glaciers and will eventually experience flooding of coastal cities. Something should have been done 30, 40, 50 years ago but we can only play with the cards we’re dealt. The generations were those who could have done something, we are the generation that need to do something. Sarah – I just realised some of the links in your post don’t work, as the “http:” bit is repeated. You can fix them by editing your post, selecting the text of the link, and pressing the ‘link’ icon again to see the link details. Perhaps relating the melting of the glaciers more directly to human life can help people understand why this topic is important. Right now it seems as though we should save the glaciers for the sake of preserving marine life, which may cause more ignorant people to argue that we can simply stop eating marine life. Do you think the average reader is concerned with the fact that “glaciers have lost 67% of their total mass” or with what this means for their everyday life. It’s a good idea to refer to your graph in your text and have a sentence explaining the graph as its relevance may not appear immediately clear to some readers . There may be some error in blaming past generations as they did not possess the kind of information we possess today about this issue, nor did they possess as much information on how to address the issues. Excellent. You’ve made it clear that melting glaciers play a role in the health of marine life by way of changing ocean salinity. Okay, but definitely references your sources in your post rather than putting them mostly at the end. You do this sometimes, but not always. As Abayomi points out, you’ll want to reference the chart you’ve included, as well as reference other statements of fact that you make (e.g. “Certain species are more effected by the change in salinity than others”). Also, watch your sources: the link to the PDF from the WWF doesn’t directly give me information on ocean warming. I was faced with having to sift through a massive document; at the very least include a page number. I’m not sure how to judge the credibility of source for the average amounts of salt figures you quoted. Maybe you could dig deeper for the scientific sources they used? You’re writing is really engaging. I suggest a stronger introduction which plainly states the issue you’re discussing and it’s relevance as a challenge of climate change. You’ve done a good job of explaining your topic on the whole. But, I’m a little confused by your explanation about glacial melt water affects ocean salinity: you talk about salinity both rising (“If we continue to see a rise in salinity…”) and falling (“… in an environment with a lower salt level”) as glaciers melt. I’m also not sure why you listed the various salinity classes of water since you don’t really refer to them later. Spot on. You’ve done a great job of telling a cohesive story about how climate change will affect marine life because of melting glaciers.